At age 64, Ralph T. Warburton, M.D. could have retired. Instead he considered the future of health care in Stark County and directed his energies towards creating a medical foundation that provided high quality, accessible medical care. Dr. Warburton and his wife Esther enlisted the help of other physicians who shared a vision of improving the health of our community. 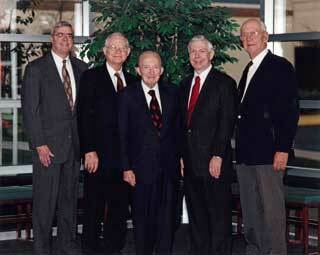 Doctors Grant A. Mason, Michael B. Mock, Hugh M. Pratt and Thomas B. Shipley joined Dr. Warburton in his quest for not-for-profit status. Through the dedication and passion of these physicians and with the support and contributions of local foundations, business leaders, and government representatives, the Foundation received its permanent 501(c)3 designation as a charitable foundation in 1971. The doors officially opened in December of 1972 with five on site physicians. North Canton Medical Foundation has established deep roots in this community. That is why we will continue to grow our mission by collaborating with and supporting programs delivering accessible healthcare that have an overall impact for our community. By our continued commitment to our mission and the support of contributors we will continue to be the organization that you have come to trust.